It seems like bomber jackets are back in fashion this year as well as velvet. I am not really an avid follower of fashion trends but I am always happy when classic pieces reappear in seasonal collections and make their way to store windows. For instance, Zara had a full collection of bomber jackets this year. So I could not wait to get my hands on a velvet bomber. 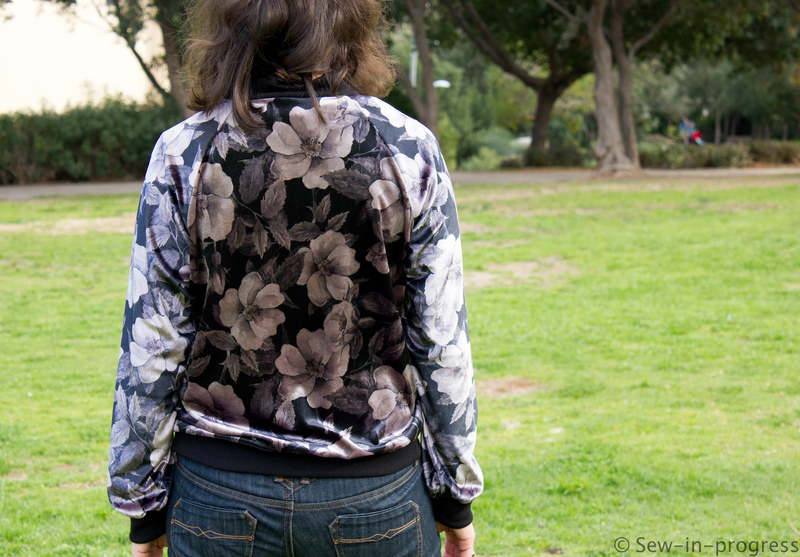 Several sewing patterns are available for a bomber jacket and all are up to the task. So I had a hard time deciding but in the end I went for the Rigel Bomber from Papercut patterns. This pattern is very popular and many photos are available in sewing blogs. I chose this pattern because I thought that it would work best with my fabric. I liked that in this pattern the main fabric goes all the way to the bottom in the zipper section. I also liked the neckline. I bought this gorgeous velvet fabric from a local store and it has quite a bit of stretch. I know that the pattern asks for woven fabric but this one worked just fine. The pattern is not complicated and has really good instructions but I had a hard time sewing the welt pockets. This was my first time sewing welt pockets and I destroyed two front pieces and had to start all over to get it right. Also, the slippery velvet made it more difficult. I am glad that I had extra fabric left to cut two other fronts. In the end, I searched for other instructions in the internet and found those of Professor Pincushion (Here) and Colette (Here) especially helpful. After passing the welt pocket obstacle, the rest of the pattern was pretty straightforward. I made a muslin size S and it fit really well so I used that size. I also saw that many people lined the jacket. I wanted a lighter jacket and I liked the wrong side of fabric so I did not line it. I did use bias binding for the edges of the facing as suggested by the instructions and it worked pretty well. Overall, I really like how the jacket turned out and will use this pattern to make more. I saw your review at Pattern Review this morning and popped over to your blog. Lovely jacket, beautiful fabric! I am glad you posted your review about this bomber jacket. I am looking for the pattern that the front extends to the bottom of the zipper. I was happy to read that, as the McCall’s pattern was a super fail for me. Enjoy wearing your lovely jacket. Thank you for your lovely comment. I am glad that you found the review helpful. Hopefully this pattern will work better for you if you decide to try. This is so beautiful! I love your fabric choice! Great job- it’s awesome!